To manage your navigation menu, you must first log into your website by clicking on the Login link at the bottom of your home page. After logging into your website, you will be be directed to the dashboard. In the Dashboard Menu, scroll down to the MyOilSite section and choose Menus. 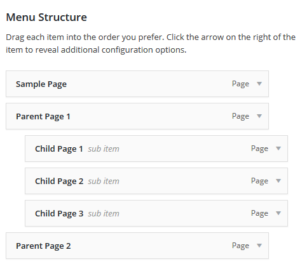 Navigation Label – This field specifies the title of the item on your custom menu. This is what your visitors will see when they visit your site. 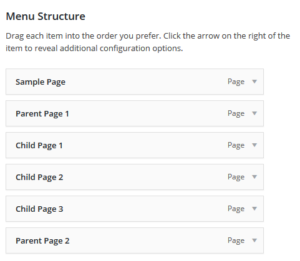 Change menu item visibility – This sets the permission level required to see the link. You generally won’t use this option. Move – This provides quick options to move your menu item to another spot on the menu. 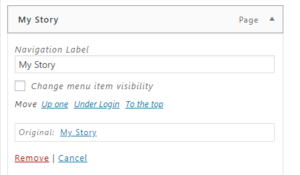 Alternatively, you can move your menu items using drag and drop (see next section for details). The menu editor allows you to create multi-level menus using a simple ‘drag and drop’ interface. Drag menu items up or down to change their order of appearance in the menu. Drag menu items left or right in order to create sub-levels within your menu. While holding the left mouse button, drag it to the right. 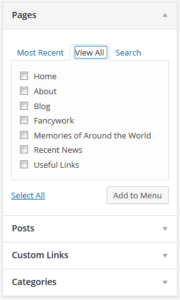 If you wish to reset your menu back to its original state, return to your Dashboard and scroll down in the left-side menu until you find the Recovery section. Under Recovery, choose the Website Reset link. On the page that opens, click the “Reset Navigation Menus” button under the “Reset Menus” section. This will restore the original menus for the website.